Very good news is coming for the teachers working in non-government secondary schools in the state. The Uttar Pradesh government has decided to honor the teachers working in non-government secondary schools (vitta vihin) to award the Chief Minister's Teacher Award. Nearly 19275 state Madhyamik vidyalaya are affiliated to the Secondary Education Council in the state. These schools are not provided any kind of financial help from the government. About 75% of these schools are contributing to the education sector. Shikshak of manyta prapt vittavihin vidyalaya have a special contribution in delivering secondary education to the rural and remote areas of the state. Keeping this in mind, the state government has announced the announcement of the CM Teacher Award. Under this, the teacher who has done outstanding work will be honored with the Chief Minister's Teacher Award. This decision was taken in the Uttar Pradesh Cabinet Meeting on November 13, 2018. Under this decision has been taken to confer the Chief Minister Teacher Award to the teachers working in the Government Secondary School. The teachers will be awarded in Chief Minister Teacher Award. Under this, ₹ 25,000 cash will be given. This Mukhyamantri Shikshak puraskar will be delivered on the birthday of former Prime Minister Atal Bihari Vajpayee on December 25. 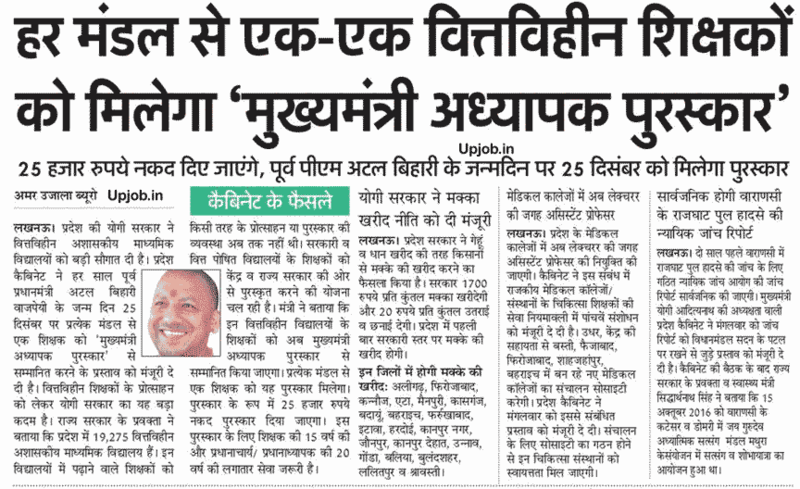 State Yogi Sarkar gave a big gift to the non-financed secondary schools. From now on, every year teacher will get honor by the Chief Minister Teacher award on, Atal Bihari Vajpayee birth day on December 25. Only one person will be given a prize. For this award, continuous service of 15 years of service and Principal Principal is required for 20 years continuous service. Details of important information related to Mukhyamantri Shikshak award are given below. Selection Process - A teacher will be selected for the Chief Minister's award on each zone. Award Money - Under this, a teacher will receive a cash prize of Rs 25000.